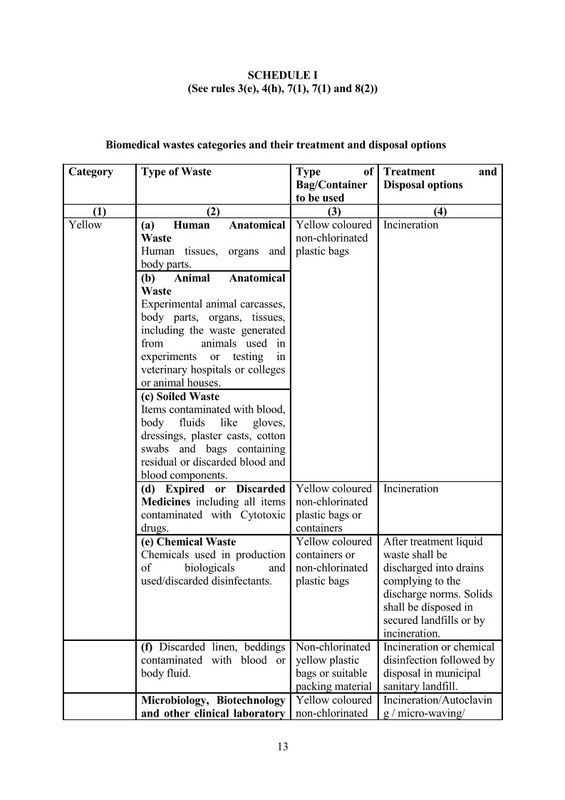 According to Biomedical Waste (Management and Handling) Rules, 1998 of India, “Any waste which is generated during the diagnosis, treatment or immunization of human beings or animals or in research activities pertaining thereto or in the production or testing of biologicals is considered as biomedical waste”. The Government of India (notification, 1998) specifies that Hospital Waste Management is a part of hospital hygiene and maintenance activities. This involves management of range of activities, which are mainly engineering functions, such as collection, transportation, operation or treatment of processing systems, and disposal of wastes. Biomedical waste management has recently emerged as an issue of major concern not only to hospitals, nursing home authorities but also to the environment. In India, the Bio-medical Waste (Management and Handling) Rules, 1998 and further amendments were passed for the regulation of bio-medical waste management. Each state's Pollution Control Board or Pollution control Committee will be responsible for implementing the new legislation. (a) Take all necessary steps to ensure that bio-medical waste is handled without any adverse effect to human health and the environment in accordance with these rules. (b) Provide training for all its health care workers and others involved in handling of biomedical waste at the time of induction and at least once a year thereafter. (c) Immunise all its health care workers and others involved in handling of bio-medical waste for protection against diseases including Hepatitis B and Tetanus that are likely to be transmitted by handling of bio-medical waste. 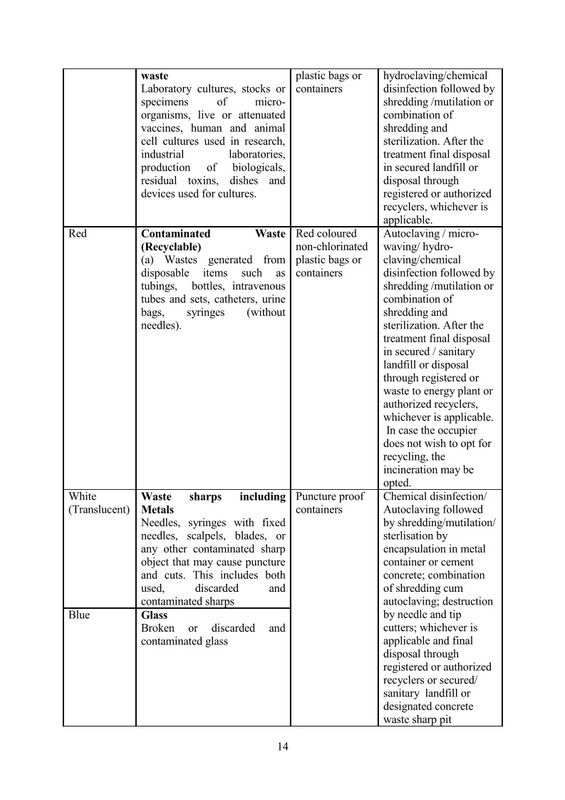 (d) Ensure segregation of bio-medical waste at the point of generation in accordance with these rules. (e) Ensure occupational safety of all its health care workers and others involved in handling of bio- medical waste by providing appropriate and adequate personal protective equipments. (f) Conduct health check up at the time of induction and at least once in a year for all its health care workers and others involved in handling of bio- medical waste and maintain the records for the same.